We’re still here, with twelve years of experience in supplying and fitting synthetic grass under our belts, so we must be doing something right. We were the first in the market and are still the best because of our commitment to solving our customers’ problems. Having said that, we know we are only as good as our last job. 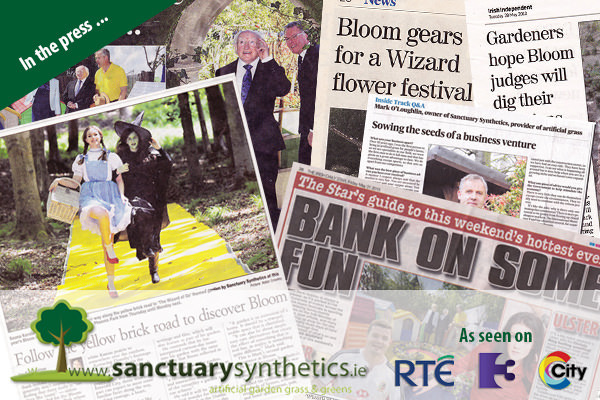 We offer a landscaping design service – we don’t expect you to be a Diarmuid Gavin, and don’t worry, we’re not really like him either, but we won the silver medal at Bloom 2011. Our staff are uniformed, courteous, fully trained, conscientious and work for us. They all have the Safe Pass. Testimonials and thank-you cards motivate us. Our grass is made in Europe and we guarantee the grass for ten years, yes, a whole decade. We send out a free sample pack with a quotation, containing a selection of grasses so you can more easily decide which one is right for your space. It is made of high quality TenCate fibres with a ‘caressing’ feel (TenCate is a leading textile development company). It has a high HIC (Head Injury Criteria) value which means that it has good shock absorbency for falls from height. It has been tested to European standard BS EN1177 relating to playground equipment safety. It is approved by the API in the UK, the body for registered play inspectors. It is recommended by Ofsted, the official body for inspecting schools in the UK. It is well within the European Energy Reach directive’s standards for lead, zinc and other hazardous materials.